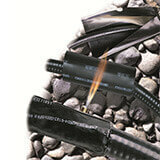 Providing solutions for cable jacket repair, primary insulation cover and re-jacketing cover. The use of heat shrink wraparound sleeves eliminates service interruptions when repairing damaged cable jackets or retrofit protection of exposed connectors on secondary service cables. 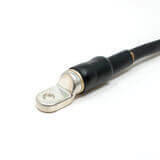 For example, CRDW offers a thick coating of hot-melt adhesive that encapsulates the entire splice to prevent moisture ingress and risk of connector and conductor corrosion and eventual failure. 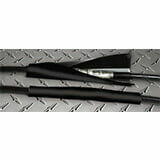 This adhesive-lined, heat shrink wraparound sleeve is closed with a flexible stainless-steel locking channel. Used for general re-jacketing and sealing applications, protection of damaged cable or repair of cable joints, it installs easily in splice applications that are typically longer in length. This superior wraparound insulation product installs easily in repair and splice applications, providing excellent insulation and protection for cable jackets. An innovative option for heat shrink tubing, this wraparound sleeve have become the favored option in cable repair and retrofit protection of existing cables. 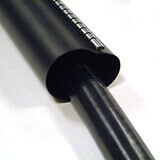 This medium-wall heat shrink tubing is suitable for a variety of low voltage electrical and mechanical applications where lighter weight and greater flexibility are important.